Modern Aachen is a spa town with a beautifully preserved medieval old town and an almost magical occidental cathedral. Historically this Roman city, built at the point where Germany borders Belgium and the Netherlands, was made great by Charlemagne. It was also the place where German Kings were crowned and has been a major centre of Christianity. You’ll find some of the best places to stay in Aachen within or within a short walking distance of the old town. The Romans founded Aachen next to the steaming, sulphur-y, mineral springs, and used it as a place of rest and recuperation, but it was probably its location that appealed to the Holy Roman Emperor Charlemagne when he made it the winter capital of his Frankish Empire. Charlemagne built the Dom around 800AD, and it’s also where he’s buried. But it was during the 14th and 15th centuries when the cathedral's modern shape began to appear, with its Gothic choir and north and south chapels with their classical pillars and glasswork. This is a truly amazing building, so much so that it was the first building Germany proposed for listing as a UNESCO Heritage Site - which of course it has been since 1978. The Rathaus, or Town Hall, is probably the old town’s other main sight, and there’s also a beautiful market square and numerous ancient buildings, including bathhouses, city gates and some really lovely fountains. As well offering visitors the opportunity to ‘take the waters’ in one way or another, Aachen is also well known for its Christmas Market and its sweet factories. Aachen now has a large university so it’s a lively place to go out in the evening - especially during December. While you’re here it’s worth taking the short trip to Dreiländereck just outside the small Dutch town of Vaais, which is just beside Aachen. This is the point where Germany, the Netherlands and Belgium meet - as well as being the highest point in the Netherlands - and there’s a great watchtower you can climb to compare the nations. Our pick of the best places to stay in Aachen will be very busy during peak periods (like November and December when the Christmas Market's in full swing), so get organised and book well ahead. 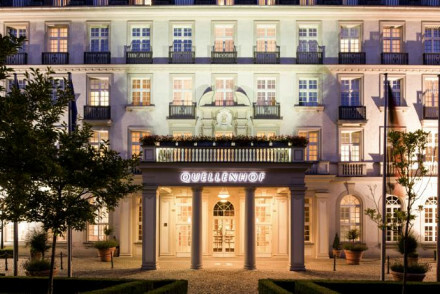 The Pullman Aachen Quellenhof is a five star hotel with a beautiful Neoclassical facade, 183 elegant rooms, a bar and brasserie and a well equipped spa and fitness centre. You’re around 2kms from the station and a 15minute walk from the Palatine Chapel. Benson’s Hotel is a B&B in central Aachen, with 14 cosy, contemporary rooms in bold colours and decorated with modern art. Expect a good breakfast. The Hotel Granus is a modern hotel just ten minutes walk from Aachen’s old town, with just 12 smart rooms and a quaint breakfast room serving indulgent Continental breakfasts. Rooms start from around €90 per night. The Landgasthof gut Marienbildchen is outside of Aachen on the fringes of the Eiffel National Park. It’s a traditional German country hotel with eight simple, comfortable rooms and wonderful views over the surrounding countryside. Hotel Zum Walde is located a short distance outside Aachen but is perfectly placed for exploring the Venn-Eifel Nature Park. And with rooms from as little as €68 per night it's fantastic value for money for a four star property. Families will love it too with its wide range of accommodation including self catering apartments. The nearest airport to Aachen is actually in the Netherlands: Maastricht (25 miles). To hire a car, visit our online partner Rentalcars. The best time to visit Aachen is from June to September, when the temperature sits comfortably in the twenties. Browse through our list of all the best places to stay in Aachen. Have a look at the best places to stay in the Rhineland. A 5 star hotel with an imposing neoclassical-inspired facade, elegant rooms with thai silk curtains & large comfy beds, brasserie, bar and a well equipped spa and fitness centre. Right on the border with The Netherlands and Belgium this hotel is an ideal base for business or leisure. A modern hotel just minutes drive away from the historic centre. A host of suite options are available each with contemporary design. A spacious restaurant specialises in Mediterranean cuisine. An indoor pool, range of steam rooms and spa are all waiting after a day's work. Ideal for professionals. Local exploring - Though just outside the cenre of Aachen you're well placed for exploring the city and further afield.